Roses come in a staggering array of colors, shapes, sizes and scents. A favorite of cultivators and gardeners, roses have been hybridized for centuries. Roses are a flowering perennial that can be found in shrub or climbing vine varieties. They are propagated either from a seed or a cutting. Growing roses from cuttings allows you to clone your favorite plants to increase your rose garden or exchange rose plant cuttings with a fellow gardener. Cut a long cane from a mature rose bush. Select a cane from the current year's growth that is still green and about the width of a pencil. Cut the top off the cane just above a bud so that you are left with the lower 5 to 8 inches. Remove all the lower leaves and leave one to two leaves at the top of the cutting. Make three half-inch vertical cut in the bark at the bottom end of the cutting. Just break the bark while avoiding the soft wood underneath. Roll the bottom of the rose cutting in hormone rooting powder or dip it in liquid hormone rooting mix. Fill a 4-inch planting pot with a sterile soilless potting mix. Make a 2-inch hole in the center of the pot that is slightly wider then your rose cutting. Put the bottom end of the cutting into the pot and fill in the soil around it. Water the pot until it is thoroughly damp. Place a clear plastic bag upside down over the pot. Secure the opening of the bag around the lip of the pot with a rubber band or twist tie. Remove the plastic bag every four to five days and water the cutting until the potting mix is damp all the way through. Remove the plastic bag when you see two or three new leaves growing from the cutting. This can take anywhere from two weeks to two months and indicates that roots have begun to develop. Transplant the rooted cutting into a 8- to 10-inch pot filled with potting soil. Water the pot until it is thoroughly damp and place it in an area that gets dappled or indirect sun. Transfer the rooted cuttings into the ground in the spring as soon as the soil is workable. Put three or more cuttings in a large pot; you will save space and increase your chances of obtaining a successfully rooted cutting. Cuttings can be taken any time of year, but July to September is best for Northern cool climate gardeners, November to February for Southern warm weather gardeners. 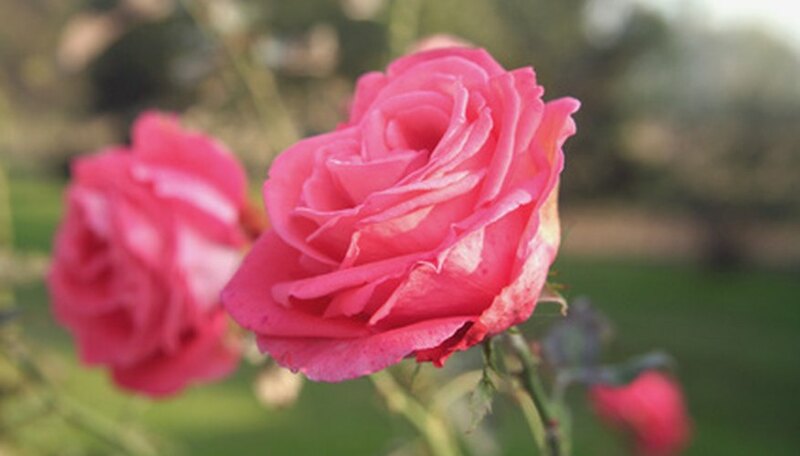 Roses have sharp thorns--wear gloves and protective clothing when handling these plants.